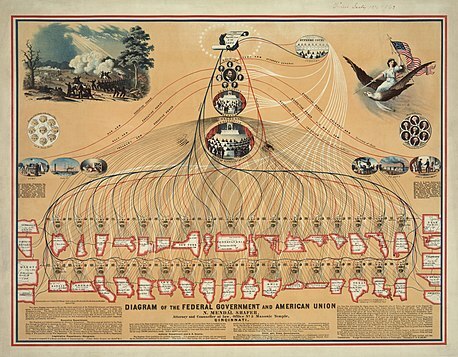 Diagram of the Federal Government and American Union, the first constitutional republic. This print was published in 1862. A constitutional republic is a form of government, where the head of state and other representatives are elected from a group of people. It also means that there is a constitution. The constitution says how the state may be run. The constitution limits the power of each officeholder. Constitutional republics usually have a separation of powers. This acts so that no single officeholder can get unlimited power. John Adams said that a constitutional republic was "a government of laws and not of people". A constitutional republic is an attempt to limit the dangers which result from a simple majority rule. The constitution limits the power of each officeholder, and protects rights of minorities from the "tyranny of the majority". In a constitutional republic, no officeholder can get to a position of absolute power. Aristotle was the first to write about the idea in his works on politics. Constitutional monarchies are a special case: even though the monarch is not elected, the people still elect other governing bodies. The constitution also limits the power of the monarch. This page was last changed on 10 April 2019, at 18:37.